Home / Fiction / Father’s day special: Best Dad. Straying away from the financial scene for a brief moment, here’s my writeup whom I feel deserves the “Father of the Millennium” title. Without further hesitation, I bring you Darth Vader. As some would say, Vader had a troubled life. He was born to a single mother and absentee dad. His mother slaved away working hard to assure he had everything needed for a growing boy. It wasn’t until he was apprenticed in a mechanic shop that his life took turn for the better. Having to make ends meet, young Anakin worked for a hard working salvage trader learning how to fix and repair electronics and vehicles. He took to pod racing for adventure and a way to earn some extra coin. This skill earned him the attention of a young Jedi called Obi-Wan Kenobi. Kenobi later took Anakin as his own student when his teacher died in an industrial accident. A few years later, Anakin was severely burned in an industrial accident while inspecting a metal refinery for his employer. His long time teacher and friend quickly abandoned him to avoid filling out stacks of paperwork on the failure in safety protocol. He was later found by the department head on a routine site tour and brought in for medical help. Sadly both arms and legs had to be amputated and his face covered in a surgical mask for restoration. Due to an error in a report Vader was told his wife and unborn children had died during delivery. The reality was worse though, they had survived but Obi-wan quickly found foster parents for the children in hopes to avoid having to pay out a huge loss of life insurance payment to Padme after Anakin’s untimely death. Emperor Palpatine personally took interest in Anakin’s rehabilitation, having worked with him in the past and seeing great potential in Vader’s skills and ability as a legal enforcer of regulatory standards. Palpatine used cutting edge cybernetic limbs and a custom built suit for Vader’s recovery process. Due to regulations and restrictions, he had to change Anakin’s legal name to Darth Vader to avoid potential lawsuits. Vader was assigned under Grand Moff Tarkin’s department to oversee development of the Empire’s new mobile research lab the Flower Star. But certain environmental groups opposed to the project gave it a derogatory name “The Death Star”, but that’s for another time. The embattled Flower star program suffered more troubles when the reactor overcharged and the excess energy was released into outer-space accidental destroying a nearby uninhabited planet Alderaan. Tarkin was killed in a following industrial accident when environmental terrorists sabotaged the reactor’s emergency vents blocking harmful gasses from escaping and causing the oribtal research lab to explode. Vader fortunately survived as he was assigned to the survey crew to see where the vent damage was occurring. Feeling that something was not right, Vader utilized his new promotion and company resources to search for his son, whom and had a strong feeling was really alive. As his connection to the force grew stronger, he had started to see through Palpatine’s misrepresentation of facts in the industrial accident that left him crippled. But he couldn’t press charges just yet with only a strong hunch. So he went looking for Luke and Leia. Vader’s hunch proved correct, when on a routine scan of various planets, Luke was found on Hoth. After personally heading an Envoy to meet Luke, Vader was shocked to learn his son had just left moments ago and strayed away from the fleet heading to an unknown destination. Vader’s setback was shortlived though as he again found Luke during a tour of the mining facilities in Bespin’s cloud city. To Vader’s dismay though, he discovered that Luke was brainwashed by the anti-corporation group known only as the Rebellion. Vader then, working with a private investigator Boba Fett, planned to reunite with his son and offer him employment in his branch of the Empire. 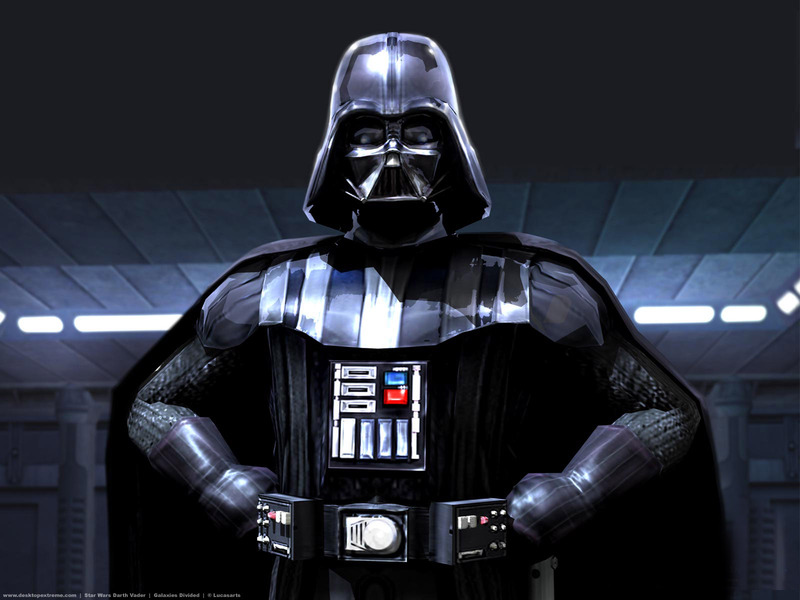 Through several unsuccessful attempts at communication, due to Luke’s aggressive behavior and violent attacks, lead Vader to be cornered and have to take up a defense stance. This confrontation lead to a walkway overlooking the garbage chutes of Cloud City. It was here that Vader, under great duress accidentally cuts off Luke’s hand with their laser cutter also referred to as a lightsaber. Luke finally calmed down enough for Vader to start talking. So Vader, excited to finally meet his son face to face, told him about their relation and made one heck of an awesome job offer. Vader also revealed his plan to take over the company as President and CEO making Luke Executive Vice President. Still believing that giant corporations are evil Luke selfishly declined the job offer, with an amazing benefits package. He instead being a little ingrate jumped into the garbage bin. Devastated by his son’s spurning, Vader storms off believing Luke to be dead. A few years later, Vader was overseeing the construction of a new orbital research lab. This Flower station was researching the indigenous life on the moon Endor. A moon with vast natural resources and other properties of scientific significance. Reports came in the the anti-corporation environmental group was planning to stage a huge protest on the moon Endor. They were protesting the site where a planet-side research station was built ,claiming it was harming the natural migration and food patterns of the local wildlife. Vader suspected his son may actually have a role in this and secretly allowed the small group of protesters land. By this time Vader too was displeased with his boss and planned to file an HR report on work conditions. Vader discovered that his son was in fact on the planet and yet again scheduled him for an in person job interview and a meeting with the CEO, Emeror Palpatine. Luke agreed to this, not for the job, but to be able to voice his protests to the top boss thinking that he may actually achieve something. Such is the extents of successful brainwashing. Luke being the misguided hot head he is decided to try and murder the CEO instead of accept the job. 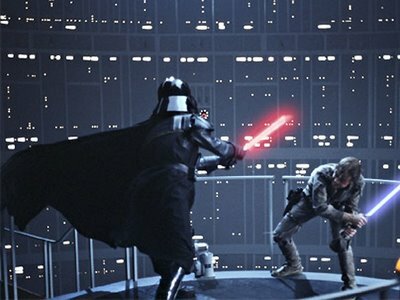 Once again Vader was forced to not only defend his boss, but to defend himself against his own son. This assault and the crazy ramblings of an old man that should have retired years ago became maddening to Vader. He grew angry and lashed out harder against his son, finally disarming him. The emperor, who had grown crazy in his old age was rightfully angry at almost being murdered. 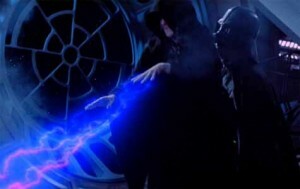 Without giving either side a chance at reconciliation, and the fear of the lawsuit of the century, he tried to kill Luke using an old trick of discharging a Tesla coil in a concentrated direction. Vader was terrified the electrical currents would short out his suit’s electronics but he had to do something to save his son. So he grabbed the emperor and tried to restrain him. The old man proved strong and wriggly. Vader lost his grip and accidentally dropped him in an open air duct that lacked any measure of safety signs. Squirmy for such an old man. Sadly, the electrical discharge did short out the electronics of his suit causing the built in iron lunch to malfunction, reducing Vader’s oxygen supply. Wheezing, they both hobbled out towards the medical station. To their dismay though, the Rebel terrorists had again been sabotaging the peaceful research station and it was being evacuated for safety reason’s. Needing air, Vader begs Luke to help remove his mask. 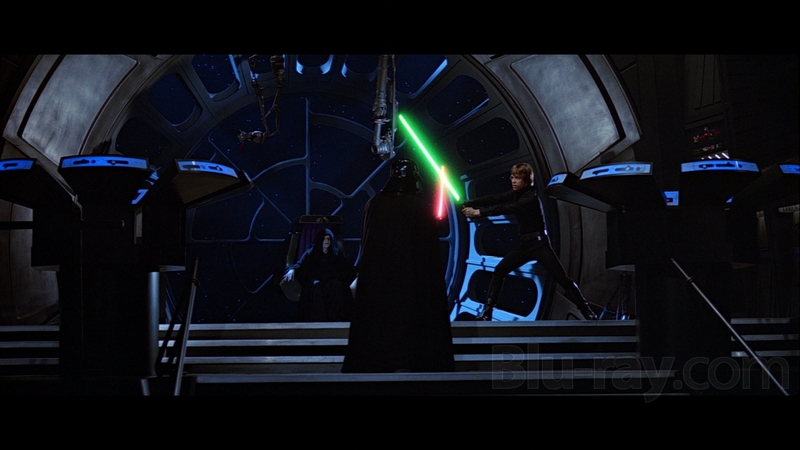 Luke ignorantly argues that Vader may die if his mask is removed. Desperate for air, Vader makes up some story about seeing Luke with his own eyes. This is what industrial accidents look like years later. 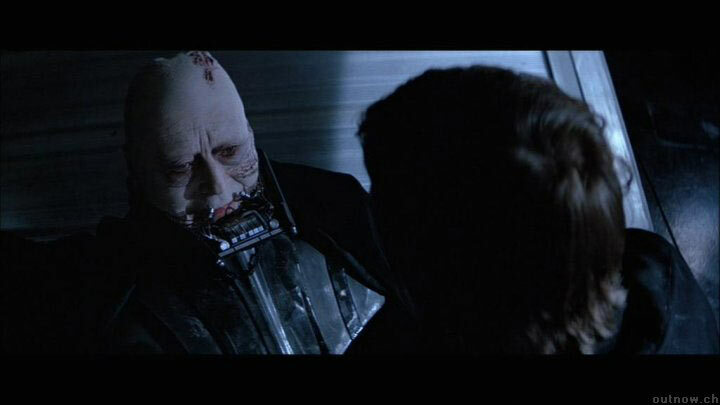 Luke finally agrees and struggles to help his father take off his mask. But to his dismay, he was too slow and Vader died soon after of asphyxiation. 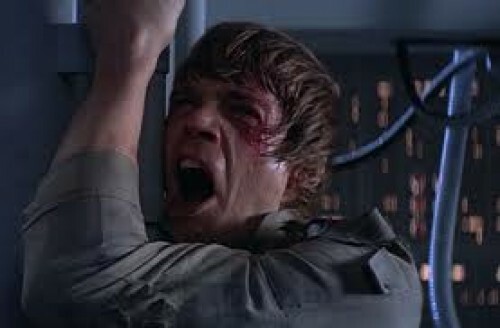 Luke then takes his father to the planet and cremates him in a pile of industrial waste. This great sacrifice is why Vader deserves the title for Father of the Millennium. He dedicated his life and misappropriated company resources to finding his son and daughter once he learned they were in fact alive, having been fostered their entire life. He died defending himself against his son’s maligned anger and trying to reason with him despite constant assaults. Despite constantly being turned down, Vader gave his son multiple chances at gainful employment to no such luck. Therefore Happy Father’s day to all you dad’s, who may never had known their own children for one reason or another.